Oslo is the capital of Norway and situated at the end of the Oslofjord in a bowl of hills and mountains. While the town is similar to Stockholm in many ways, almost everything is on a smaller scale. If Swedes are known of being modest it’s nothing compared to the Norwegians and this is evident in their traditions as well as customs when it comes to indulge themselves. They simply don’t, instead they go hiking and enjoy their marvelous nature. In 2012 Oslo was named the most expensive city in the world. It’s not that surprising since Norway has become one of the richest nations in the world after they found oil in the late 60’s. 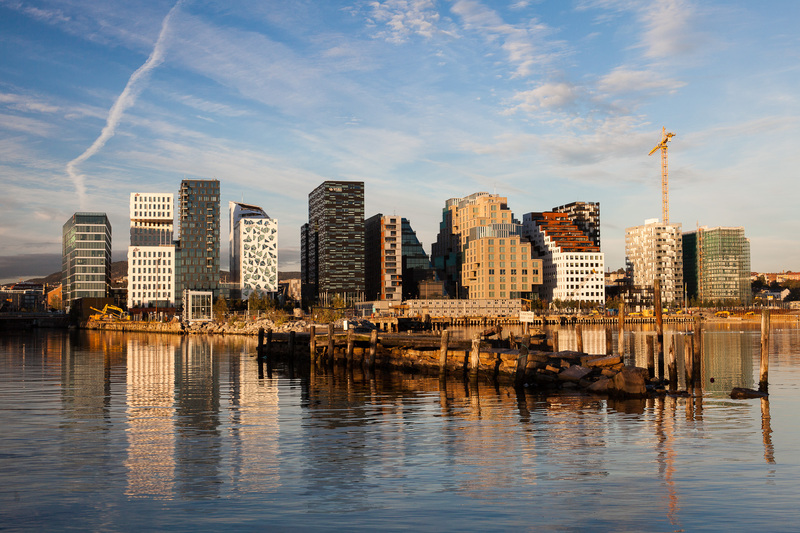 High salaries across both private and government sector, strict work laws and high taxes on imported goods makes living in Norway quite an equalizing (and pleasant) experience, but visiting can seem very expensive. Finding high quality, good value deals can be frustrating. Due to the strict working laws and a shortage of working force in the expanding economy many in the service based professions don’t really care about their customers. There are exceptions of course but it’s quite a contrast to other bigger cities. The flip side is that there are very few pushy salespeople. A slight change in attitude has led to some truly spectacular new developments in the last decades. The new Opera house was finished in 2007 and the entire area between it and the central station is now transformed to a ultra modern business and residential area featuring spectacular high-rises. It’s known as “Barcode” due to the way the row of buildings look when seen from the station. Tjyvholmen outside Aker Brygge and Vulkan in Grünerløkka are other examples of this. View from The Thief over Tjuvholmen and the Astrup Fearnley museum at the right. 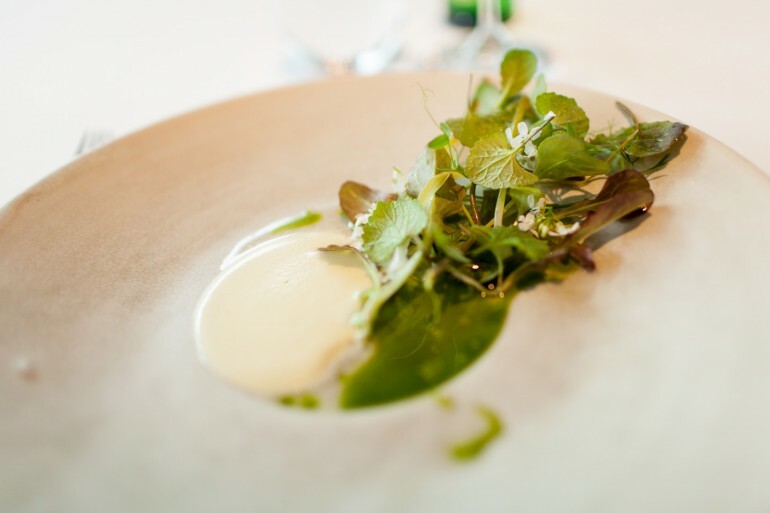 Bitter greens with garlic mustard and yogurt whey at Maaemo. The Norwegians have quite strong traditions relating to food, especially for “smørbrød” eaten as lunch (an open sandwich that is). During school lunch is not served for the children so they must bring their on lunch to school, and that is traditionally always a couple of sandwiches wrapped in paper. For many this tradition also lives on in their working life. Norway is otherwise known for its very expensive food, and if you eat at the first restaurant you see in the tourist areas you will be paying quite dearly for food of questionable quality. Oslo is, just like Stockholm, in a development and experimental phase when it comes to cuisine. A lot of interesting places have been popping up during the last couple of years. Most restaurants, coffee houses and bars ran by enthusiasts who actually care about what they serve are located in Grünerløkka. We’re sorry to say, that if you are interested in shopping this is not the right place for you. Taxes on merchandise is high in Norway and their own products are expensive due to labor costs, meaning that most brands will be more expensive here than in London or New York or other major cities. This doesn’t mean that there aren’t any places if you are in Oslo and still would like to spend some time looking for new things. Karl Johans Gate is a long shopping street with the most common brands, such as H&M and others in similar price range. If you follow this street from the central station and towards the castle it will lead to more interesting places. Steen & Strøm Magasin is located near Karl Johans Gate and is a high-end department store. Around it the major global luxury brands and a couple of the Nordic ones have their own stores. For more specialized brands EGER might be more of interest. It is a trendy fashion mall with more than 300 international brands represented. For example, they carry Canali, Incotex and Crockett & Jones for the gents and Lanvin, Matthew Williamson and Missoni M for the ladies. Grünerløkka features lots of odd little shops, both vintage shops as well as specialty stores. One of the more interesting ones, and at times useful, is the combined travel accessory store and café Chillout on Markveien. Grab one of the chili-chocolate cinnamon buns and a cappuccino to experience genuine, home-made global-nordic fusion baking (if this makes sense?). Aker Brygge has been a major hub for getting out into the fjord and the biggest attraction in Norway itself since it was completed in 1998. It features bars, restaurants and shopping. 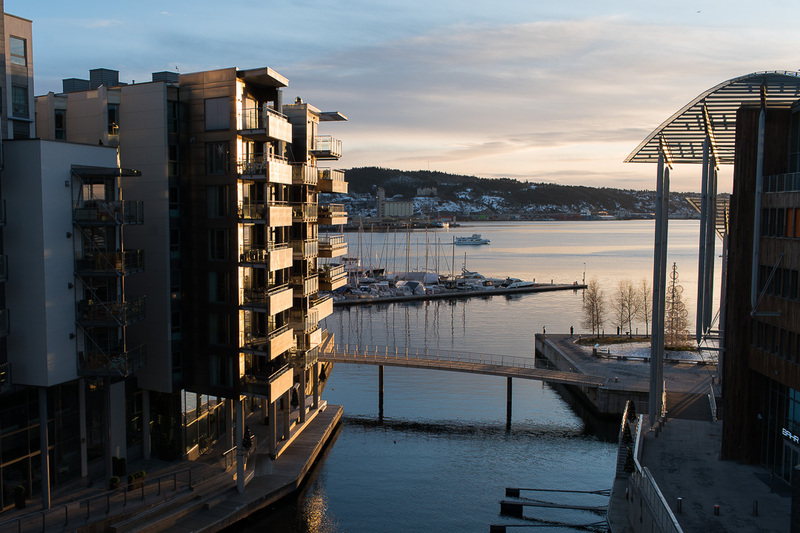 A new addition, Tjuvholmen, features spectacular views, a number of new exciting restaurants and the Astrup Fearnley Museum museum of modern art that combines a grand location for temporary exhibitions as well as an adjacent building for the permanent collection. Stroll around Grünerløkka, experience Norwegian hipster culture and drink coffee at one or both of the world class coffee bars here. Tim Wendelboe became World Barista Champion in 2004 and his crew continue to collect accolades. They are are purely focused on coffee to place it solely in focus, just like in a wine tasting. Supreme Roastworks is more relaxed and dynamic, with a more diverse range of coffee and even having some small pastries available. Not to be outdone on titles, Odd-Steinar Tøllefsen of Supreme became won the World Brewing Championshop in 2015. A great little hike is to follow Akerselven from the Stargate at Grønland up through Grünerløkka and Torshov. One of the hidden gems for alternative art and culture can be found right before you get to Vulkan, but there are many beautiful sights along the way as well as a glimpse into everyday life in Oslo. A girl in traditional outfit on the 17th of mai. Norway celebrates their National Day on May 17th. This is an official holiday and they celebrate it like few others. 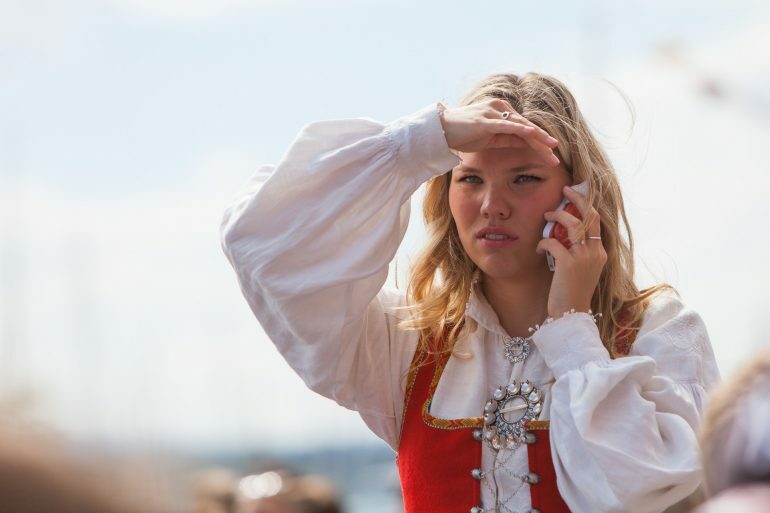 Practically every Oslo citizen dresses up in traditional clothes and goes out on the town. What they actually do is a bit of a mystery, but it usually starts with a big breakfast followed by watching “barnatåget” (a parade of school children walking past the king) and eating hot dogs and ice cream. They then find somewhere to eat out before going home. Since it’s a holiday most of the town is closed except for restaurants and due to the sheer amount of people booking is necessary. Most who wants to party goes to Aker Brygge where it gets very crowded.